With so much hype going around about this book and movie, I figured it would be nice to give my views on it. I found an interesting pamphlet at mass today, and am going to share it here with you, for discussion purposes only. The pamphlet was produced by OurSundayVisitor. If you would like bulk copies of it, you can contact them at 200 Noll Plaza, Huntington, IN 46750 or by calling 800 348-2440. 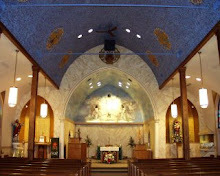 You can also visit www.osv.com for information. (Pamphlet # P319.) It isn't my intention to plagiarize the work done on this pamphlet, but I firmly believe the authors did an excellent job in researching their facts, and more people read blogs than attend mass looking for info about The Da Vinci Code. All credit goes to Amy Welborn and her research for OurSundayVisitor. For this blog entry, I am merely a humble typist. The Da Vinci Code was first published in 2003 and has remained on or near the top of bestseller lists ever since, reaching tens of millions of readers worldwide. With the release of a film based on the novel, directed by Ron Howard and starring the popular Tom Hanks, the message of The Da Vinci Code will reach millions more. But what is The Da Vinci Code really all about? The "code" at the plot's center refers to cryptic messages that the artist supposedly incorporated into his work. Leonardo, as the story goes, was a member of an ancient secret society called the "Priory of Sion." This group was dedicated to preserving the "truth" that Jesus was married to Mary Magdalene and had designated her as the leader of His movement, which is all about the appreciate of the "sacred feminine" in life. The "Code" claims that the legendary "Holy Grail" is really Mary Magdalene, the bloodline of the descendants she and Jesus produced, and the "sacred feminine" that she represents. The Da Vinci Code film dramatizes these claims in flashback form, gives them life, and will probably prompt even more people to ask: Could the traditional Christian understanding of Jesus be false? The claims about art, history and religion made in The Da Vinci Code are not original, but are all taken from other works. First there are books of pseudo-history (Holy Blood, Holy Grail; The Templar Revelation) from which every bit of the story connecting Jesus, Mary Magdalene, the Holy Grail-as-Mary, and the Priory of Sion are taken. Brown also depends on speculative and fictional works about Mary Magdalene (The Woman With the Alabaster Jar), from which he takes the notion of Mary as the designated leader of early Christianity. Curiously, Brown never refers to any book of the New Testament nor to any of the writing or liturgies of the early Christian Church as he discusses Jesus' identity or what early Christians believed about Jesus. Was the Son of God Invented? Both the Da Vinci Code novel and film assert that the early Christians viewed Jesus as merely a "mortal teacher" and that is was only at the Council of Nicaea in 325, under pressure from the Emperor Constantine, that belief in Jesus' divinity became official Christian teaching. This simply is not true. The Gospels and letters of Paul, as well as writings and liturgies from the centuries preceding Nicaea, give ample evidence that Christian faith was based on a belief that Jesus was the Son of God. they worshipped Jesus as Lord. What Nicaea did was to correct the heresy of Arianism: the belief that Jesus was a highly exalted creature - but a creature, nonetheless - who did not share in God's nature. (Catholics) repeat the Council's affirmation of Jesus' human and divine natures when we say the Nicene Creed: "God from God, Light from Light, True God from True God." This was not an innovation. It was simply a more precise articulation of the truth about the Jesus we encounter in the Gospels. In The Da Vinci Code, the scholar Dr. Teabing (played by Sir Ian McKellan) declares that at the time of Nicaea, there were "thousands" of texts documenting a very human life of Jesus. He says that there were 80 gospels in circulation, 80 gospels that give the story of the "original Christ" that Constantine repressed and - if the film is to be believed - personally had burned! The implication is that during the first three centuries of Christianity, there were many accounts of Jesus' life, all equally reliable, and that the selection of the canon - the books of the New Testament determined to be inspired by the Holy Spirit and to be used by the entire Church - was based on nothing but a desire for power. This is not true. First, there were not "thousands" of such texts. There were certainly more than are contained in the Bible, but relatively few with any confirmed link to apostolic times. Further, by the middle of the second century, Christian writers regularly cited the Gospels of Matthew, Mark, Luke, and John, as well as Paul's letters, as the most reliable sources of information about Jesus' life and the faith of the apostles. And, contrary to Brown's story, it wasn't under Constantine that the canon of Scripture was formally accepted. That happened at Church councils decades later, after a great deal of prayer and debate. For his part, Brown launches his fictional account from texts that were produced by heretical groups in the late second through fifth centuries as more reliable sources for this "original Christ." But most scholars agree these text have no value in understanding Jesus or apostolic Christianity. The story of The Da Vinci Code asserts that Jesus must have been married because that was the norm for Jewish men at the time, and He wouldn't have been taken seriously as a religious teacher if He had not been married. The Gospels describe Jesus' interaction with the people of His hometown. If Jesus had been married, given the frequency with which other relations are mentioned, the marriage would have been mentioned as well. there would be no reason not to. Secondly, being unmarried would not have diminished Jesus' authority as a Jewish teacher. Certain Jewish prophets, Jeremiah amount them, were unmarried. John the Baptist was unmarried, as was Paul; and, during the first century, an entire community of Jewish celibates, called the Essenes, lived near the Dead Sea. In other words, while being unmarried would have been unusual for a Jewish man, it would not be unheard of, especially for a man totally consumed by dedication to God. Brown says that Mary Magdalene was of royal blood, of the tribe of Benjamin, and Jesus' wife. According to his story, after the Crucifixion, Mary, pregnant with Jesus' child, moved to France and became the root of the Merovingian royal family. He also says that Jesus intended Mary to be the head of His church, but that Peter seized power from her, suppressed all evidence of Jesus' real intentions, and set into motion a 2,000-year conspiracy to demonize Mary Magdalene. But belying that assertion is the fact that Mary Magdalene is honored as a saint in both the Catholic and Orthodox Churches - so one wonders what basis he has for the accusation that she's been "demonized." Mary is honored in Christianity for her faithfulness to Jesus and her role as witness at the empty tomb. Orthodox Christians cal her "Equal-to-the-Apostles" for this reason - not because she led any alternative branch of Christianity in competition with Peter. While legends from Western Christianity describe her as evangelizing southern France, no legend mentions any power struggle or any "alternative" Christian group. If she had led such a body, and if Peter's branch was so anxious to suppress her, it hardly makes sense that they would retain the portions of the Gospels describing her a the first to meet the Risen Christ! Brown claims that Leonardo Da Vinci communicated this "truth" about Jesus and Mary Magdalene in his work, and gives several examples to make his point. But it's hard to believe what Brown says about this art, considering how regularly he incorrectly describes the content of the painting and garbles the historical background behind them. He write, for example, that the John in "The Last Supper" is too feminine-looking to be a man (thereby concluding it is meant to be Mary Magdalene). However, it was traditional during the time when Leonardo painted "The Last Supper" to represent John as a beardless attractive youth. Brown says that since there is no Last Supper chalice or "grail", the "grail" must be Mary Magdalene. However, there is not chalice in the painting because it portrays a scene from the gospel of John )13:21-25) in which the Institution of the Eucharist is not described, and the Last Supper is not specifies as a Passover Meal - hence, no central chalice. Opus Dei, a central element in The Da Vinci Code, is characterized as a radical, cult-like fringe group, associated with the Catholic Church. In the story, this group is all about control and repression of the truth. However, this depiction, in both novel and film, is not only inaccurate but unjust. What are the facts? - Opus Dei ("Work of God") was founded by St. Josemaria Escriva, in Spain, in 1928. - It is an institution fully approved by, and part of, the Catholic Church, with a mission to help lay people develop their spiritual lives. - It involves a number of different levels of membership. Some associated with Opus Dei benefit from its retreats and spiritual direction while living completely in the world at secular jobs, with families. Others live in Opus Dei houses and commit to celibacy. - There are priests associated with Opus Dei, but there are definitely no monks. - Opus Dei runs many institutions throughout the world dedicated to education, spiritual development, and healthcare. The Da Vinci Code's portrayal of Opus Dei is not even a caricature; it is a fabrication. More can be found at the group's website: http://www.opusdei.org. http://www.osv.com/davinci for other articles on The Da Vinci Code. I'm still not able to sit down and update this daily... but here's a bit of humor to brighten your day!!! Catechism. Well, that bear wanted nothing to do with me and began to slap me around. So I quickly grabbed my holy water, sprinkled him and, Holy Mary Mother of God, he became as gentle a lamb. The bishop is coming out next week to give him first communion and confirmation." Reverend Billy Bob spoke next. He was in a wheelchair, with an arm and both legs in casts, and an IV drip. In his best fire and brimstone oratory he claimed, "WELL brothers, you KNOW that we don't sprinkle! I went out and I FOUND me a bear. And then I began to READ to my bear from God's HOLY WORD! But that BEAR wanted nothing to do with me. So I took HOLD of him and we began to wrestle. We wrestled down one hill, UP another and DOWN another until we came to a creek. So I quick DUNKED him and BAPTIZED his hairy soul. And just like you said, he became as gentle as a lamb. We spent the rest of the day praising JESUS." They both looked down at the rabbi, who was lying in a hospital bed. He was in a body cast and traction with IV's and monitors running in and out of him. He was in bad shape. The rabbi looked up and said, "Looking back on it, circumcision may not have been the best way to start." I believe there is no such thing as a 'true' Christian. When fanatics use that term, they are trying to elevate themselves above all other believers. No one is more Christian than the next person. The difference between Christians is simply the strength of their walk with God, and only the person and God know how strong that is. Knowing the bible, or doctrines, or answers to difficult questions does not mean that someone has a strong walk with God. 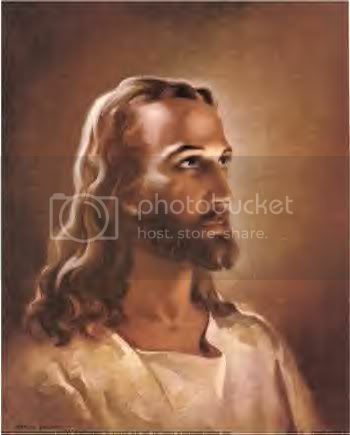 The only human being on earth that knew all the answers was Jesus, when he walked among us as a human. Even his disciples didn't know all the answers! He constantly taught them, and others, as is evident in the Gospels. In fact, so many early Christians got the message wrong that the rest of the New Testament is nothing more than letters to the early churches that tell them they are screwing up the message of the Gospels! A while back, I found myself beginning to hate Protestants because of a certain chat room... and I have never had a problem with Protestants before! I had to actually sit down and think out why my attitude changed back then, and when I did, I realized that my hatred wasn't towards Protestants, but towards the fanatics who give Christianity a bad name. They interpret the bible without any theological background or prayer (and without the Holy Spirit to guide them.) They make assumptions on scripture, twisting it to fit their own agenda. They judge everything that doesn't follow their own personal doctrines. They hardly attend church. They may spend hours pouring over their bibles, but they would never be able to spend more than a half hour in prayer... and when they pray, they probably only do it to ask God for something. I'm not pushing the Catholic faith here, but it is the only faith I know. When we do our private bible studies, if we have a question about something we read, we can always tramp down to our parish and ask a priest. The priest, being human, can give his opinion of the verse, but he can also say how, historically, the verse has been viewed. The extra input and opinion helps to make sense of things. If there is still conflict, discussion is always welcomed. Priests are not perfect, and there have been a few who have come away with a 'question session' with me having a different outlook of their own. (Not bragging... but showing that we are all human, and sometimes our personal view on things is limited to just our own experiences.) I'm sure Christians can go to their pastors the same way, but I wonder how many of the bitter ones actually do. I've met up with people online who have a shaky walk with God. Their walk used to be very strong, but over time, the relentless rants of chat room fanatics have seemed to have cast a shadow in their hearts. They are so repulsed by the actions of others, that they despise being associated with the words 'Christian' and bible. I guess the only suggestion I can really give to people being influenced by the bitterness is... pray. I don't mean sit there and ask God to 'make things better'. Prayer is nothing more than conversation with God. Sometimes, all God does is sit quietly and listen, so you can use him as a sounding board. There's nothing fancy to it. You don't start out by worshipping him or telling him how much of a horrible sinner you are. You just talk to him, either out loud or in your head. There's a lot of times that mine start out with 'Okay, God, this doesn't make sense... got a moment?'. Honestly, God doesn't always answer. I can spend an hour mulling over a problem, just throwing out things that come to mind, and in the end, I still don't know the solution to something. But, I come away from the process feeling refreshing because I got things off my chest. I have a better grasp on the situation because I spent the time working on it. God does answer at times, by the way. Sometimes it's just a gentle nudge in a new direction. Sometimes... and I know this is hard to believe, but... he does actually answer. It's a humbling moment, trust me. lol. I think the fanatics spend so much time judging others because they resent the fact that they have never felt the presence of God in any place other than their church sanctuary... and they may have never even felt him, and were caught up in a emotional (human) revival instead. Remember the Samaritan woman... she couldn't go to the Jewish temples and pray with the men. 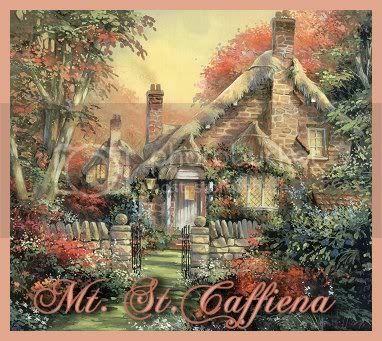 Jesus told her that God was not limited to a temple, but that he was everywhere, even in the mountains and along the road. He told her every sin she had ever done... because he is God and would know them. He didn't judge her, but spoke softly to her. And, he went on to speak about everlasting life. He gave her promise of the beauty of Salvation. Here was a woman who was shunned by her village (she went to the well alone, which means the other women of the village would not tolerate her presence with them!) Here was a woman who was a known harlot. Yet, after she spoke with Jesus, she ran back to her village and told them everything he told her. She spoke with such passion, having just had a long talk with God, that she convinced her village to come back to the well and listen to him. Her. A sinner. A harlot. A shunned woman. Yet, the village went to meet this Jesus, and listened to what he had to say. Jesus did not use Pharisees to spread the Word... he used people like you and me. Common, ordinary, somewhat confused people. Don't let the Pharisees of Christianity make you doubt God. They may not know what it is to be embraced by him. Don't let their opinions make you hate the word of God. They cling to bible passages as Law, and use them to keep the masses looking bad so they can look good. Don't let their words make you bitter towards the Lord. They are perhaps bitter because they do not have a passionate walk with God. Luke 18... it pretty much helps clear up doubts. You can read the whole thing, or you can read the one parable in Luke 18:6-14. It's a really short passage, but one that has always inspired me, personally. Just a reminder... still on vacation! Today is June 6, 2006... or 6/6/06. Why people put so much stressing into dates is still beyond me. It doesn't matter when Christ returns. All that does matter is that He will return, eventually. We are not to know when... only God knows that. Instead of dwelling on 'the end of the world', live each day as if it was your last. Live each day for Christ. Live each day with God as the most important thing, and live each day in a sincere effort to do good works and bring the message of Salvation to the world. Show compassion towards your fellow man. Be an instrument of peace. Feed the hungry, comfort the widows, protect the innocent children, and offer praises to the Lord for all that he has blessed you with. If you live out each day in this manner, you will not have to worry about the Final Day. Christ will be walking with you, and you with Him. I've said it over and over... if you don't feel close to God, guess who moved. To me, this Final Day nonsense makes as much sense as the gun freaks whining about registering on a Federal database. If you are not doing anything wrong, and are following the laws, you have nothing to worry about. No one is going to storm your house and take away your gun. Likewise, if you follow God's laws, and strive to refrain from sin (but remember to humble yourself and ask God to forgive you when you do screw up), the last day is not something to fear. If it happens in our lifetime, we should rejoice and be glad in it! Don't sit in your darkened house, wailing and hiding from the world, in a state of worry that the world is going to end on June 6. This isn't what God wants. God wants you to go out into the world and do your work, with joy in Him in your heart. God wants you to breathe deep in the Holy Spirit, and to be a blessing and an example of Christ to those you meet each day. 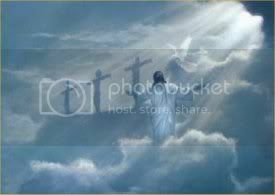 Matthew 23:36-44 (Jesus said) "No one knows about that day or hour, not even the angels in heaven, nor the Son, but only the Father. As it was in the days of Noah, so it will be at the coming of the Son of Man. For in the days before the flood, people were eating and drinking, marrying and giving in marriage, up to the day Noah entered the ark; and they knew nothing about what would happen until the flood came and took them all away. That is how it will be at the coming of the Son of Man. Two men will be in the field; one will be taken and the other left. Two women will be grinding with a hand mill; one will be taken and the other left. Ecclesiastes 8:16-17 When I applied my mind to know wisdom and to observe man's labor on earth -his eyes not seeing sleep day or night- then I saw all that God has done. No one can comprehend what goes on under the sun. Despite all his efforts to search it out, man cannot discover its meaning. Even if a wise man claims he knows, he cannot really comprehend it. I will be taking a mini-vacation over the next week. I'll still check in with my email, but I won't be able to get much done in the way of posts for the blog. Well, at least this will give some of you a chance to catch up with all the lengthy ones I've already done here! * Christ was substituted in place of hope, as it was a Catholic Girl's school. If you have never heard this song, I urge you to google it and see if you can find a copy to download. It is a very uplifting piece. "If GOD brings me to it, HE will bring me through it." 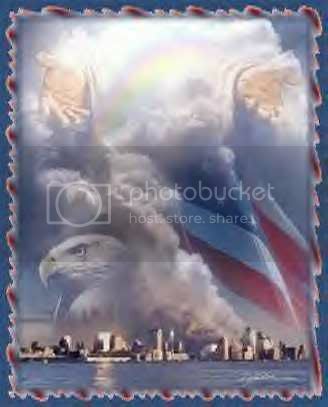 Here is the new postage stamp that will be issued in September. Isn't it awesome? This entry, however... isn't a hoax! I was giving the benefit of a doubt, assuming that no one in their right mind would actually petition to have a cross removed from a cemetery. Ann Arbor, June 01, 2006 (CNA) - The Thomas More Law Center has filed a 49-page brief in the California appellate court, challenging a state judge�s ruling that a 43-foot cross in a war memorial must be removed. 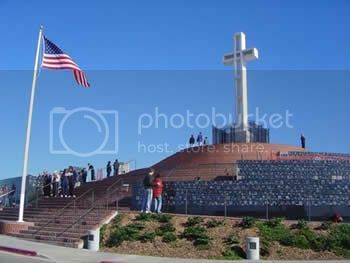 The cross has stood atop San Diego's Mt. Soledad for the last 50 years. But federal district court Judge Gordon Thompson ordered the City of San Diego on May 3rd to remove the cross within 90 days or face fines of $5,000 per day thereafter. Judge Thompson' ruling ignored the results of a special election held in July 2005, in which 76 percent of San Diego voters approved that the municipality transfer the land to the federal government as a national memorial. A motion to expedite the appeal in an attempt to have the issue decided before the 90-day deadline was also filed. If the appeal is successful, the Mt. Soledad Cross and national memorial would be transferred to the federal government. Such a transfer would moot the federal court order, which is based on a finding that the cross on city property violates the California Constitution. The Law Center has also filed a motion to intervene in the federal district court case on behalf of San Diegans for the Mount Soledad National War Memorial and to seek a stay on his order. Additionally, Law Center attorneys are discussing the possibility of White House intervention with Department of Justice attorneys, whereby President Bush would take the Mt. Soledad Veterans memorial under the federal government' power of eminent domain. In order to preserve the memorial intact, in 2004, the U.S. Congress passed a law designating the memorial a national veterans memorial and authorizing that a donation of the memorial and surrounding property be accepted from the city of San Diego. This was sent to me via email. It is from the (EWTN) Catholic News Agency, June 1, 2006. How sad. I suppose we should start wondering if people plan on removing the huge Jesus statue in Brazil because it blocks the skyline? Or, for that matter, are they going to remove all the crosses in veterans' cemeteries (since those are Federal)??! This is a 15-yr old ACLU case. Blue Star Chronicles � Save Mt. Soledad Cross a blog entry explaining how the ball got rolling, as far as a young Marine is concerned. ACLJ American Center for Law & Justice - fighting to protect rights. American Civil Liberties Union : About Us learn how a group of jackasses can throw their money and power around to deprive you of your rights. Remember, if it isn't PC, the ALCU is on it like flies on (censored). As for my liberal-minded friends... I respect you, despite what you do or how you think. I would expect that you would respect the fact that I am, have always been, and always will be anti-ACLU. Yes, this organization claims to "work also to extend rights to segments of our population that have traditionally been denied their rights, including Native Americans and other people of color; lesbians, gay men, bisexuals and transgendered people; women; mental-health patients; prisoners; people with disabilities; and the poor." As far as I am concerned, it uses those whose rights it 'defends' as a means of advancing itself. It does not balance... to get rights, it takes rights away from others. In the case of the article above, it takes away the right of the Vietnam veterans to have a monument that was dedicated to them over 50 years ago. These veterans are disabled, male and female, transgendered, bisexual, people of color, lesbian and gay men, mental-health patients, prisoners (POW/MAI to this day! ), and poor. But, forget the ACLU 'motto' here, it's the cross that isn't PC! The symbol of Christ offends them?? !